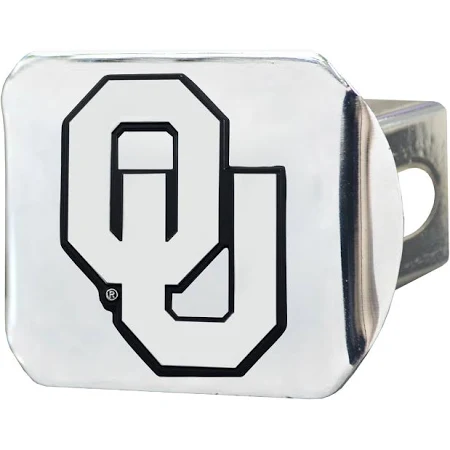 Oklahoma Chrome Hitch Cover 4 1/2"x 3 3/8" Size: 3.4"x 4" Keep your hitch clear of debris and let everyone see your favorite team with officially licensed Hitch Covers from Sports Licensing Solutions. Fits all 2"/type III hitches. Molded 3-D chrome logo and hitch cover are both made of real chrome metal. Attaches without use of tools and it's easy to take on and off. Completely wraps your hitch to keep all debris out Fits all 2 in. Class III hitches for a secure installation Made of chromed metal for a sleek design 3-D molded design to clearly outline the team logo Attaches without use of tools for an easy on and off Apply standard vehicle wax to keep hitch cover looking great for years to come Officially Licensed Merchandise.